Look into any mid-to-large scale warehouse operations and you will see vehicle mount computers in use to improve efficiencies across the facility. Especially in the case of forklifts, embedding a capable mobile terminal can improve productivity and reduce errors from the docks to the yard. Having access to accurate information at all times in real-time aids in every process from receiving to storing, moving around, cross docking and picking. In comes the VC80x an ultra-rugged vehicle mount computer, designed for some of the most extreme environments. The VC80x allows vehicle operators to go anywhere they need to go whether it be inside the warehouse, the loading dock, out in the yard, and even in the freezer. Allows for migration to Android without changing the operators experience that they go through on a daily basis. Meaning there’s no need for re-training, re-configuration, or development. Zebra’s new vehicle mount computer comes with a fast Qualcomm 1.8 GHz hexa-core and a 64-bit processor with 4GB RAM allowing operators to work smoothly today and going forward. A heated screen, heated boards, and a heated UPS battery allows for the VC80x to be used continuously in a freezer environment. A quick 10 second release mount makes it easy for operators to remove the VC80x to move to another vehicle or for device repair. Comes with a loud front facing speaker and has an instantly accessible volume control making it easy for the operator to hear scanner feedback and app notifications. 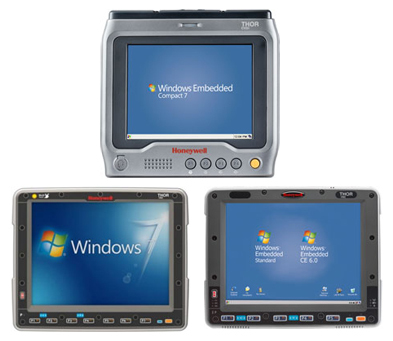 For any questions or a quote on any of your Computing needs contact us at Barcodes, Inc.
Look into any mid to large scale warehouse operation and you will see vehicle mount terminals in use to improve efficiencies across the facility. Especially in the case of forklifts, embedding a capable mobile terminal can improve productivity and reduce errors from the docks to the yard. Having access to accurate information at all time in real-time aids in every process from receiving to storing, moving around, cross docking and picking.